Are You Pregnant or Considering Pregnancy? Click here to learn more about IBD and pregnancy and the current clinical research. 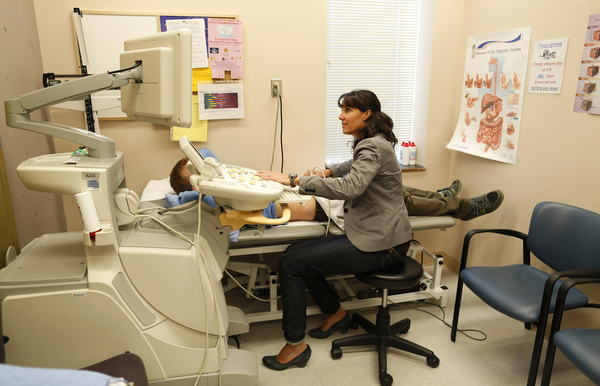 Ultrasound (US) is a safe, reliable, non-invasive method of accurately evaluating the bowel - both large and small. This techniqe is well tolerated, requires no preparation and can be used to evaluate all 5 layers of the intestine, inlcuding the structures such as vessels and lymph nodes that lie outside the bowel. It can depict complications of the bowel secondary to chronic inflammation, such as narrowings (strictures), abscesses or fistulae. It is inexpensive, portable, and easily applied in the clinic as an extension of the physical examination. The inflammatory bowel disease group at the University of Calgary is working to demonstrate the accuracy of this novel modality used in clinic for routine monitoring of inflammatory disease activity (through clinical research activities), ultimately aimed to assess patients beyond their clinical symptoms and ensure the health and 'healing' on medication. Dr. Kerri Novak, together with her research and clinical collaborator Dr. Stephanie Wilson, who is a world expert in bowel US, work closely together to provide a solid foundation in research and excellence in clinical care, with specific focus on US in IBD.